The return of the diamond cut star during the 1990s was matched by a new presentation of the "VRI" cypher, with prominently raised and separate letters in the front piece. 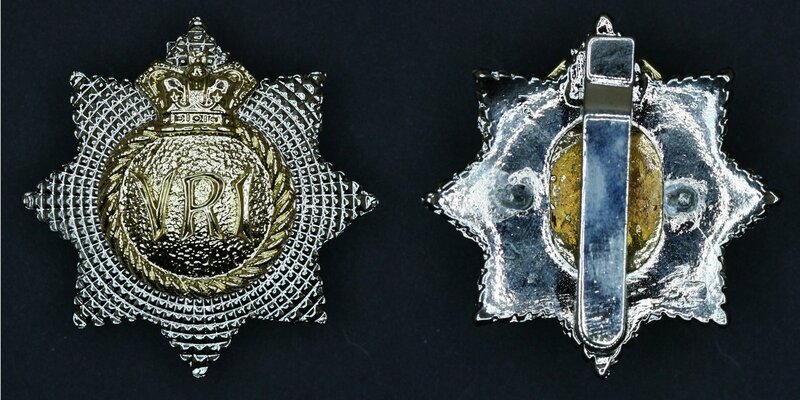 The badge was produced in a separate officer's version with silver letters, the first such badge in a some decades. It is interesting that this officer's variation was produced after the Regiment ceased wearing the forage cap, leaving its only official use as an officer's badge on the Full Dress white Wolseley helmet. 1. 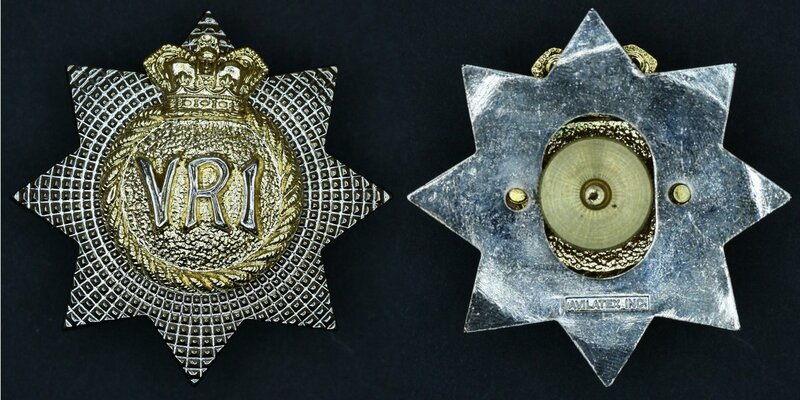 The cap badge has traditionally been described as "an eight-pointed diamond cut star; upon the star a raised circle surmounted by the Crown; within the raised circle, the block letters ‘VRI’, the Imperial Cypher of Queen Victoria." The Crown mentioned above is that depicted on Queen Victoria's Royal Arms a., approved on her accession. It is often referred to as the Imperial Crown to differentiate it from the Crown of the reigning monarch. 2. VRI is the shortened form of "Victoria Regina Imperatrix" which translated from the Latin "Victoria, Queen Empress". 3. 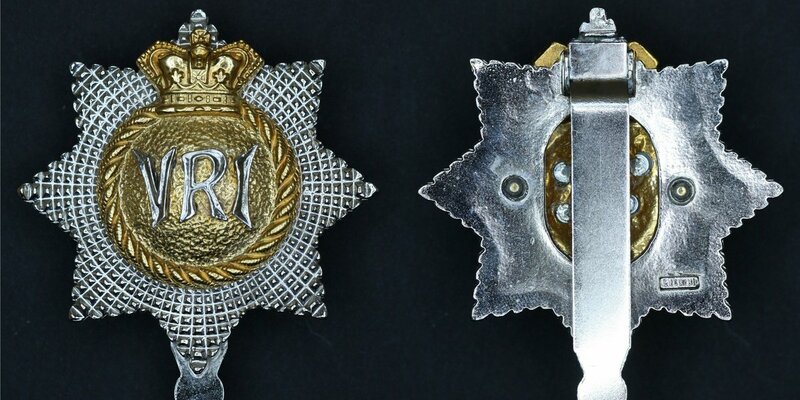 When a Royal or Imperial Cypher forms parts of a Regimental badge, it is customary for the cypher to change with each succeeding monarch. The Royal Canadian Regiment, however, was granted the right to wear, in perpetuity, Queen Victoria's cypher. This special honour was bestowed upon the Regiment in 1919 by King George V in memory of Queen Victoria and in recognition of the Regiment's gallant performance during World War I. The Royal Canadian Regiment is the only Canadian Regiment to have been accorded this unique honour of wearing a deceased monarch's cypher. 4. The cap badge is the blazer badge for the Master Warrant Officers (MWO), Warrant Officers (WO) and Senior Non-Commissioned Officers (Sr NCO) of the Regiment. 5. 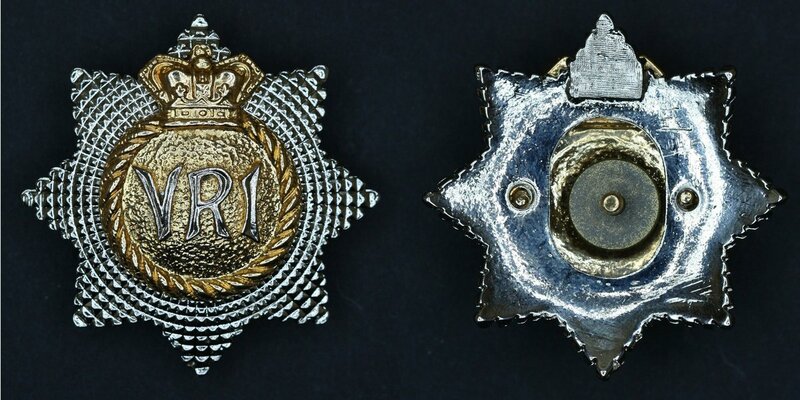 The “VRI” on the Officers', Chief Warrant Officers' (CWOs') and MWOs' cap badge is silvered, while, that for WOs and below is gilt. Various production endeavours by either the Canadian Forces Supply System or the individual battalions of the Regiment have produced versions of this badge with some minor variations. 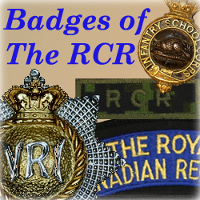 In part, these differences have occurred because those agencies were not consulting with the Regimental Headquarters of The RCR to maintain a single approving authority for the design and presentation of regimental badges. 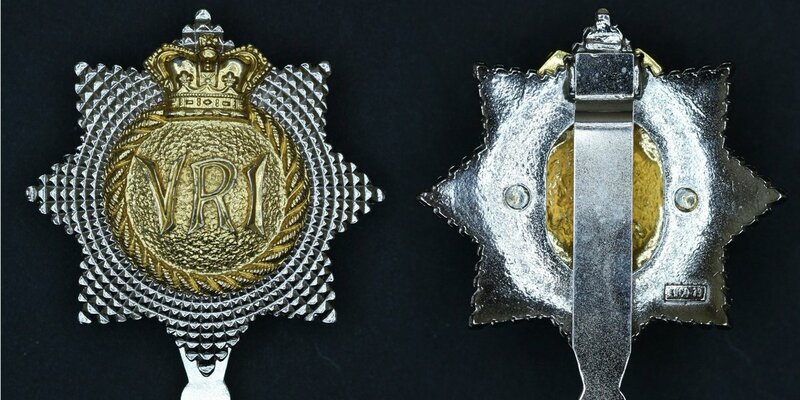 Of note is a version of this pattern regimental badge is one very close in appearance to the 1990s NCM style, except that both parts show a distinctive silvery shine. 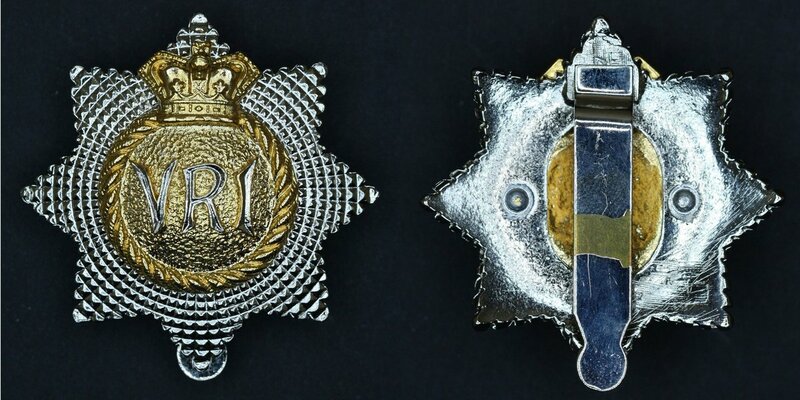 Another attempt, by a Battalion Kit Shop in 2007, resulted in an under-sized badge which was halted by RHQ before production was ordered.